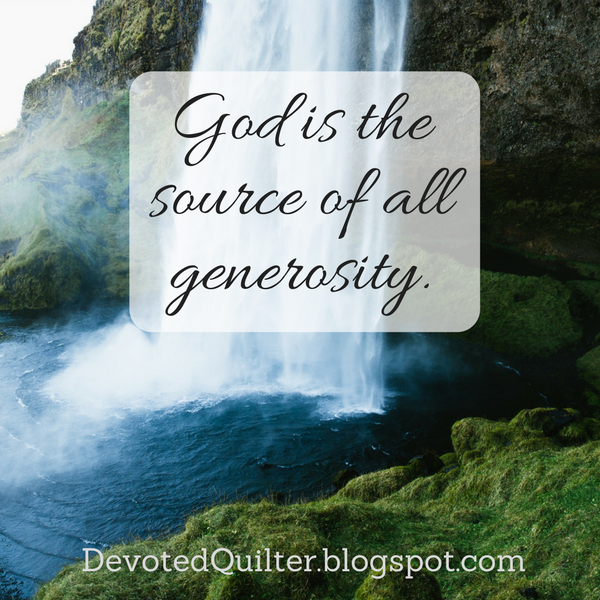 Devoted Quilter: Thanks to Who? Over the past 15 years, I've spent a lot of time around little kids. Because of that, there are some phrases that I have heard and said more times than I could ever count. One of the most common is: "What do you say?" Sometimes the children need to add 'please' to a request and, just as often, they need to say 'thank you' after being given something. As parents, we also direct the kids to say 'please' or 'thank you' to the right person, namely the person they were asking or who had given them something. With that in mind, I found it interesting to read recently in 2 Corinthians 9:11, "You will be enriched in every way so that you can be generous on every occasion, and through us your generosity will result in thanksgiving to God." The part that stood out to me as I read was the idea that any generosity from us is meant to result in thanks to God, not to us. This makes sense, of course, because it is due to God's generosity to us that we have anything to give in the first place. Whether we are being generous with our time or our money doesn't matter, as it is God who provides us with both. In fact, according to this verse, we are enriched so that we can be generous, not necessarily for our own benefit. If we can look at our lives and say that we have been enriched in any way, can we also say that we have been generous with what we've been given? Jesus also spoke about the good we do and the response it should bring. He said, "In the same way, let your light shine before others, that they may see your good deeds and glorify your Father in heaven" (Matthew 5:16). Whatever we do, we are not to be seeking to glorify or bring praise to ourselves. We are to be seeking to glorify and bring praise to Him. That can be hard sometimes, because we like to be noticed for the good we do and we like to have people think well of us. There's nothing wrong with being thanked, or with being known as good and generous people. But that shouldn't be our goal. Our goal should always be to bring honour and glory to Him. The best way to do that is probably to remember to thank God ourselves, often and openly. To remember that He is the source of all generosity. So when He uses other people to meet (or exceed!) our needs, we need to remember to give thanks to Him as well as to them. THANK YOU!!! So very appreciative and blessed that they have finally figured out a solution to my niece's health issues. God is good.